Zest and zing three ways for water hydration is what I concocted when I realized I needed to up my game in the water intake arena. I didn’t pay attention to how much fluid I took in until about a year ago. This is another aspect of managing my RA (rheumatoid arthritis) I learned to appreciate as I read more about cultivating healthy habits. I would call this gaining Arthritis Wisdom! Over half of our body weight is water, about 60% is the estimate. Our body needs water to survive. Every cell, tissue, and organ in our body needs water to properly function. Water maintains our body temperature, it transports nutrients and oxygen to cells, it removes waste and flushes toxins, it helps cushion organs and tissues and lubricates joints. This last function is particularly important for me, an RA patient. The recommended amount of water to be consumed in a day is eight 8 ounce glasses. Another recommendation I was given is to take my body weight in pounds, divide that by 2 giving me the number of ounces I need to drink in a day. We are all unique, so these two suggestions are a general recommendation. We lose water through sweat, breathing, and elimination, both by urination and stool. You may need more if you sweat a lot, exercise vigorously, are breastfeeding, have a medical condition such as kidney stones or urinary tract infection, or are experiencing a fever, vomiting or diarrhea. Plain water is the best option for hydration, but you can meet part of your daily requirement with milk, juice, soup, fresh fruits and vegetables. Caffeine and alcohol are dehydrating, so don’t include those beverages when calculating your daily fluid intake. 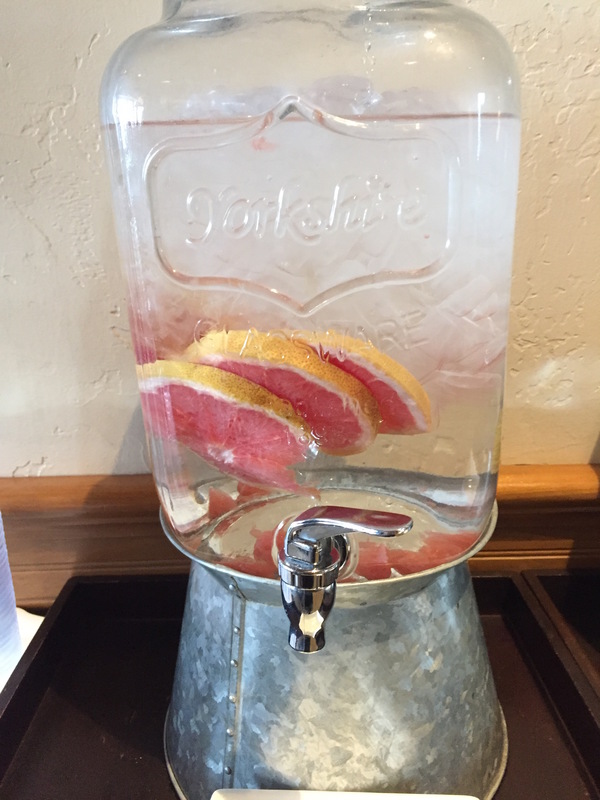 Add lemon, lime, grapefruit, cucumber, or rosemary to your container of water. It adds a fun flavor to add interest to the hydration challenge. The citrus fruits add a potent antioxidant, vitamin C, as a bonus! Add a splash of fruit juice to a glass of sparkling water. I featured my Cranberry Refresher in one of my holiday posts. You can use any juice to change it up if you’d like. I also enjoy tangerine juice added to my sparkling water! Be sure to read all labels as fruit juices often contain added sugar. Freeze berries in water using popsicle molds. I purchased my molds at a local department store. This is especially fun during the hot summer months. It just shouts “summer” to me! I have been taking my hydration challenge seriously lately. I took a long road trip recently and did not experience the usual stiffness I have in the past while traveling. I’m thinking staying hydrated helped keep my joints from becoming stiff.